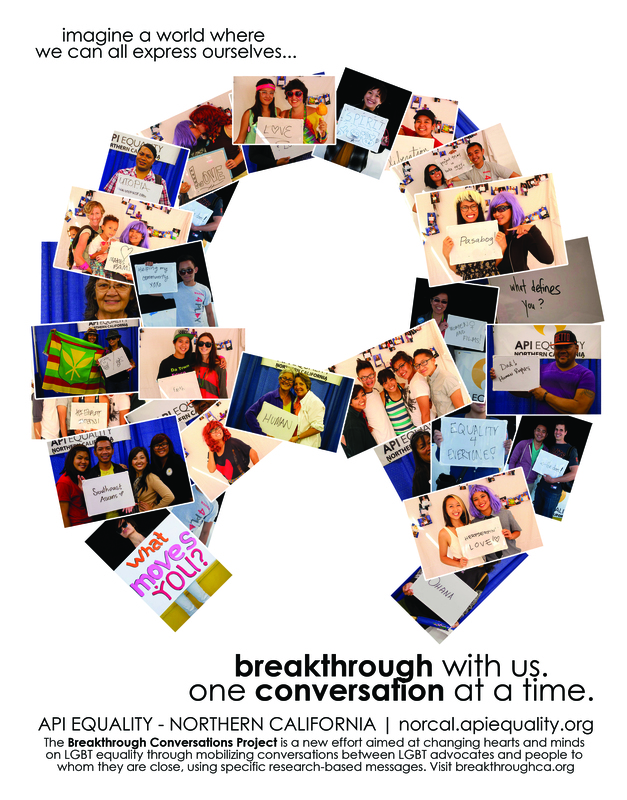 Breakthrough Conversations is a statewide coalition project. A Breakthrough Conversation is a conversation that lesbian, gay, bisexual or transgender people or straight allies have with non-LGBT people in their lives (e.g., a family member, friend, neighbor, colleague). We believe that having conversations with the people in our lives will spread awareness, tolerance, and acceptance. Defanging The “Harms Kids” Attack Line: For decades, the LGBT equal rights movement has faced an unyielding barrier in its fight for equality. No matter the issue—safe schools, anti-discrimination law or marriage equality—opponents of equality have again and again used prejudicial and dehumanizing myths about LGBT people being a harm to kids and families as a weapon against us in schools, places of worship, the legislature, in the courts and at the ballot. In the past, we didn’t have the tools to effectively counteract these messages. But since 2008, organizations and think tanks across the country have invested nearly $1 million into research to dig deeper and find ways to counter these ugly scare tactics and we are now on the verge of breaking through this barrier. Through The Breakthrough Conversation, we are conducting cutting-edge psychological and public opinion research to identify and overcome the psychological, cultural and emotional triggers related to LGBT people and kids that opponents have exploited to drive down societal and political support for equality–including the freedom to marry. HARNESSING THE POWER of PERSONAl CONVERSATIONS TO CREATE CHANGE: People who know lesbian, gay, bisexual or transgender people are more likely to accept and support LGBT people. Importantly, people who have actually talked to their LGBT friends, family members, or colleagues about public policy issues that impact LGBT people are also more likely to support policies like employment nondiscrimination or the freedom to marry. Many LGBT people and nonLGBT people report that having had these conversations actually strengthens the bond or relationship between them. But despite the incredible efficacy of these conversations, many people remain reluctant to engage in these conversations and our movement has not been able to fully leverage the power of these conversations. For these reasons, The Breakthrough Conversation project was launched to prepare and encourage LGBT people to engage in more conversations with the non-LGBT people in their lives about LGBT-specific topics and enable our movement to develop a game-changing model for effective, broad-scale social change through one-on-one engagement. All across California, people are talking to their friends, family, neighbors, and coworkers about equality. This is a tool to help volunteers keep track of their conversations and see how their efforts are shaping the way people in their communities think about LGBTQ issues.